An estimated 150 potential severe weather spotters gathered at Melvern Community Center last week to learn about weather safety and storm spotting techniques, under the guidance of National Weather Service warning coordination meteorologist Chad Omitt. MELVERN—It’s clear to see that weather affects everyone. Osage County citizens’ interest in the weather was evident as Melvern’s community building filled to capacity for weather spotter training March 2. The scheduling of the training coincided with Kansas Severe Weather Awareness Week, observed this week with a planned statewide tornado drill and presentation of weather safety information. With the crowd estimated at 150 at last week’s training, National Weather Service warning coordination meteorologist Chad Omitt and WIBW chief meteorologist Jeremy Goodwin explained the role of weather spotters and safety measures everyone should be aware of during storms. “They keep their neighbors and community safe,” Goodwin said. He said more trained weather spotters are always needed and appreciated. “Don’t assume that Dopler radar sees this funnel cloud right above your house,” he said. Omitt agreed that weather spotters must work with expert meteorologists to keep the public notified of dangerous weather conditions. Although not everyone takes time to learn about weather conditions, Omitt said everyone should know safety and preparedness measures in the event of severe storms. While people are most frightened of tornadoes, Omitt said hail causes the most injuries. When it is hailing, Omitt said, people should stay indoors. “Stay away from windows, stay away from glass,” he said. He said flooding causes more fatalities than any other weather phenomenon. Omitt said the best way to deal with tornadoes is to have a plan of action. He recommended people go to the basement or lowest point in their home if a tornado is near. If a basement is not available, an interior closet or small room with strong walls would be the next best place to be. Those in mobile homes should abandon them immediately. If in an automobile, a sturdy structure or a ditch should be found. If neither is available, he recommended buckling seat belts and staying below the window level in a vehicle. “If there is any upside to a tornado, it’s that they’re short and don’t last long,” he said. To be prepared, everyone should have a plan and hold practice drills, he said. Also, everyone should have several weather warning sources, including weather radio, television, radio or cell phone alerts. “Have a plan, practice a plan, have multiple warning sources,” he said. Omitt said that although tornado sirens could be one weather warning source, they cannot always be heard indoors when severe weather is passing through. 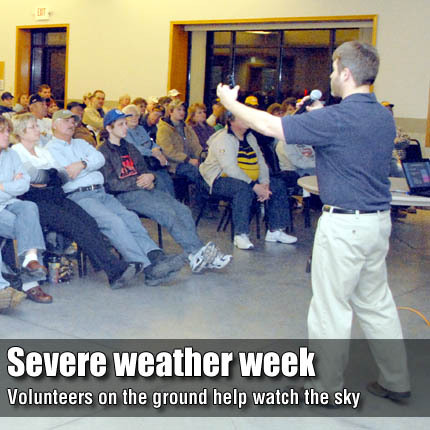 Omitt advised that one weather spotter training a year is not enough to keep informed. He suggested all who are interested to take several weather spotter trainings annually and research weather conditions through sources such as www.weather.gov. Trained weather spotters report their observations to the National Weather Service, first by identifying themselves, stating their location, the time of the event, and the type of condition that satisfies the criteria for a severe storm, such as tornadoes, funnel clouds, high-speed winds, hail and flash flooding. Tuesday was originally planned as the date for a statewide tornado drill, but due to predicted inclement weather that day, it was rescheduled to 1:30 p.m. Thursday, March 10. The purpose of the annual drill is to test everyone’s readiness for life threatening severe weather events. Every school, citizen and business is encouraged to participate in the drill by practicing seeking secure, safe shelter from a tornado. They are urged to treat the drill as if it were an actual tornado emergency. The Federal Communication Commission has granted a waiver to the state of Kansas to use the Emergency Alert System for the tornado drill. Weather radios set to receive the appropriate code will activate during the test tornado warning. Local officials might also sound warning sirens to initiate the drill. To learn more information about local weather conditions and Severe Weather Awareness Week, see http://www.weather.gov/top/.